The Annapurna Circuit winds through the Himalayas and offers some of the most exciting and challenging mountain biking the world has to offer. This extraordinary mountain bike trip, powered by our local partners at ACE the Himalaya, takes you to one of the most stunning and exotic routes in Nepal. 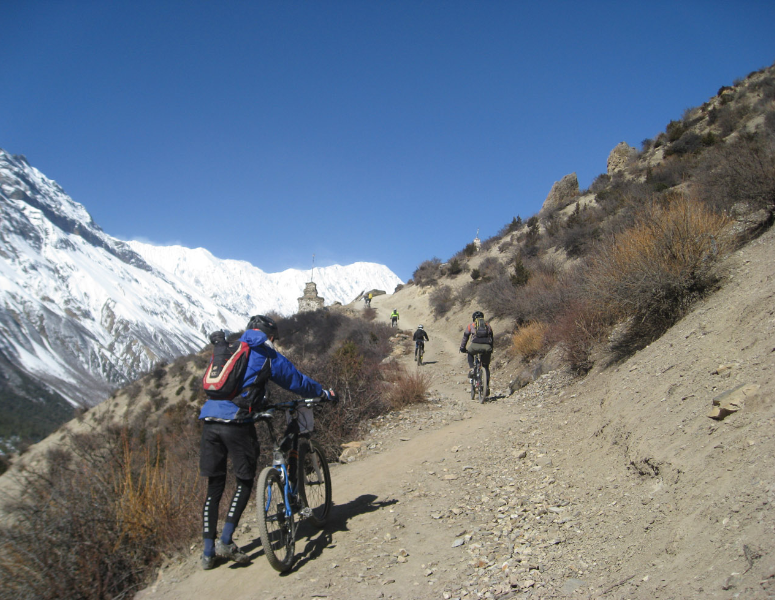 This Annapurna Circuit mountain biking trip passes through a variety of different landscapes, from lush subtropical rainforest, deep valleys and cultivated fields, to wooded alpine and high deserts. 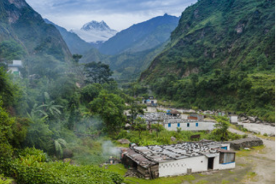 You will visit many different villages, meeting the local hill communities and enjoying frequent spectacular views of massive Himalayan peaks, including Annapurnas and Manaslu. 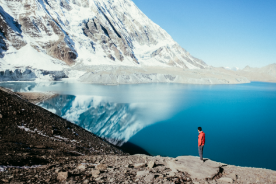 On your mountain bike, you will also reach the lowland villages, dense oak forests, deep gorges, and lovely isolated hamlets near Gangapurna lake – one of the most beautiful high altitude freshwater lakes in the world. To top it all off, you will ride Thorong La pass (17,769 ft), a challenging ascent, surrounded by some of the most magnificent mountain sceneries in the world. 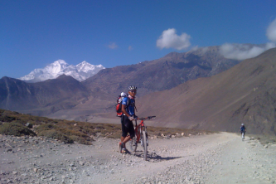 This guided Himalaya mountain bike trip gives you an amazing vantage point to ride the Annapurna circuit and discover the amazing beauty and culture along the way. Arrive at Tribhuvan International Airport in Kathmandu where you will meet an Ace the Himalaya representative who will be displaying an Ace the Himalaya signboard outside the airport terminal. You will be then transferred to your hotel in a private vehicle. 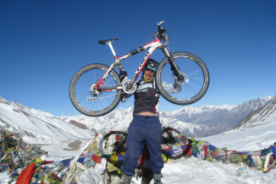 In the morning, after breakfast, Ace the Himalaya will host a pre-biking meeting in Kathmandu and introduce you to your Himalayan mountain bike guide. This is an opportunity to ask questions about your trip as Ace the Himalaya will be answering inquiries and finishing up any additional travel details. Please make sure you bring your passport, two copies of your passport-size photos and a readable copy of your travel insurance policy. After the meeting, you will take a six-hour drive to the start of the biking trip in Besisahar. Today we will ride from Besisahar to Tal. The beginning trail follows the course of the Marshyangdi River along the right side of the valley. As you ascend uphill, you gain about 3,280 feet in elevation. Today’s 21 mile ride is the perfect prelude to more thrilling riding in the days to follow. Leaving Tal, there is a mani wall (dry stone wall inlaid with Buddhist prayer slates) in the middle of the path. These should always be passed on the left going clockwise. After going through green corn, barley and potato fields, the valley becomes narrow again. The 14 mile ride from Tal to Danaque will involve a large percent of push / carry with a very steep hard climb out of Danaque. From here though it becomes more ride-able with closer views of snow-capped peaks and a wide flowing trail to the finish in Chame. We will leave our guesthouse and start our 18.5 mile journey to Manang. Ascend through pine forests as the trail opens into a fertile agriculture valley. The dirt trail leads you through villages and settlements and you get the opportunity to meet with friendly locals and children. From Pisang (10,597 ft), the route follows through a wide valley that opens up ahead of us. Today we take a break from riding and explore around the Himalayan town to acclimatize to the high altitude. There are many short excursions from Manang. One of them is a visit to Gangapurna Lake. It will take about half an hour to reach this beautiful lake. We will also go for a short hike to one of the hills which will take around an hour to reach. You can witness the majestic Mt. Gangapurna standing tall and also the beautiful lake beneath from the top of the hill. Today we leave Manang and then start climbing towards Yak Kharka (13,100 ft). Pedaling will become harder as we ascend to a higher elevation, so go slowly and enjoy the scenery and culture of the region. It is important to remain physically and mentally prepared for the highest ascent of the next day. Wake up very early for the 4-am start which is necessary to cross Thorong La Pass. The trail can get windy later making it difficult to cross the pass. It will take approximately 4 hours to reach the pass (approx 1.8 miles). You will have to carry your bike to get there. The climb is demanding, the effects of altitude can be felt more and more as you ascend but you will be awe-struck by the spectacular views of the landscape. Once at the top, rest, enjoy the feeling of getting to the highest point of Annapurna Circuit and be ready for the amazing downhill ride. After 45 minutes of technical riding, you will be in Muktinath (12,335 ft) where you can rest your exhausted body, after today's taxing 13 mile ride. 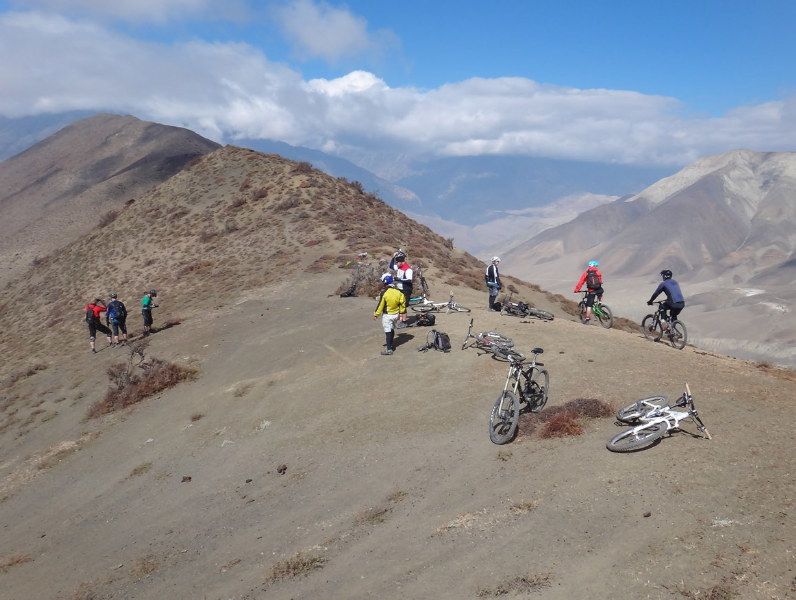 Exit the pilgrimage town of Muktinath and ride towards Dhangladanda through a less-used trail. From the viewpoint, you will be riding on impressive singletrack all the way down to the river bed in Lupra Valley. 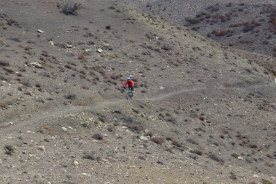 Then, pedal to Jomsom where you will rest and have lunch. From Jomsom onwards, move to the old village of Tukuche. Explore the Thakali culture of the village and take a sip of Apple Brandy. Today’s ride will be about 20 miles. Today we will ride 26 miles from Tukuche to Tatopani The start of the trail is easy to ride, but after Rukse Chaahara the trail drops about 3280 feet in elevation. This is the most challenging and enjoyable part of today’s ride. The downhill trail takes you to Tatopani, the village known for its hot springs. Once there, enjoy a refreshing hot bath. Return to Kathmandu by bus. Check into your hotel and then get ready for your last night in Nepal. Ace the Himalaya will host farewell dinner in a typical Nepali-style restaurant with cultural performances (dancing and singing) in the evening. You have the option to extend your trip with Chitwan jungle safari, rafting and bungee, Kathmandu valley shopping tour, scenic Everest flight and other activities. The trip concludes here. 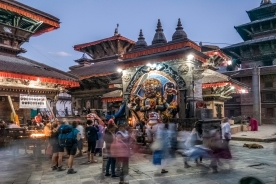 Our airport representative will drop you at the international airport in Kathmandu for your flight departure from Nepal. First opened to foreigners in 1977 the Annapurna Circuit is a must ride for anyone itching to experience the Himalayas on a mountain bike. 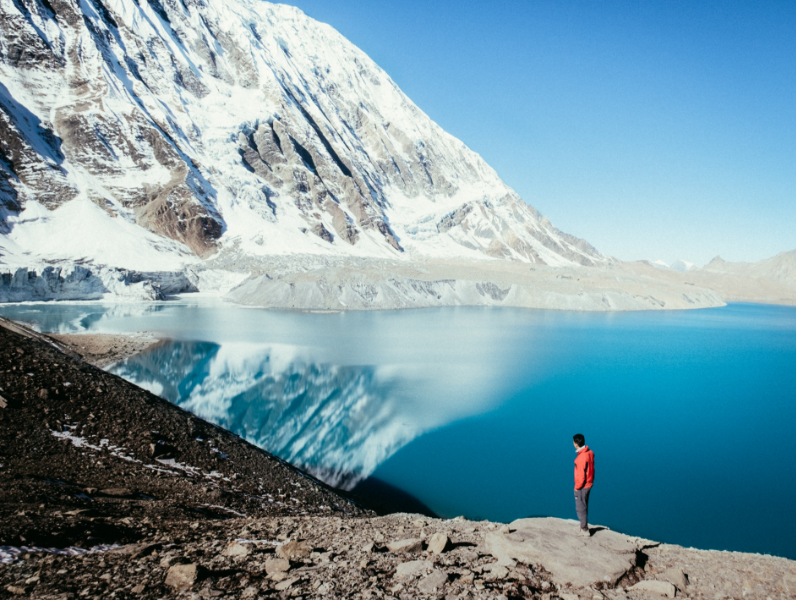 The 100-145 mile route, depending on where you start and end, navigates around the Annapurna massif, home to some of the world’s tallest peaks. 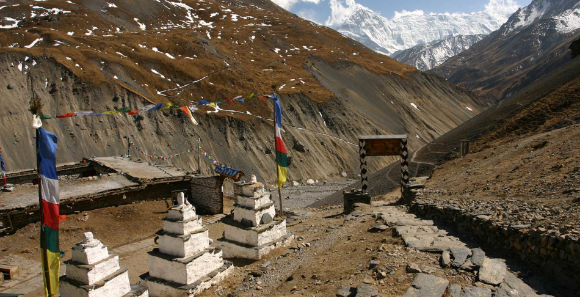 The trail crosses over Thorong La pass at 17,769 feet and winds through many high altitude hillside communities. Visitors can slow down and enjoy these beautiful villages and their rich Nepalese culture. The Circuit also offers access to famous natural sites of the region such as the blue waters of Gangapurna Lake and the natural hot springs of Tatopani. 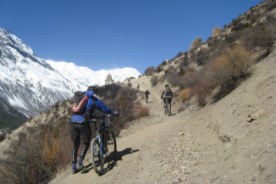 During your Annapurna Circuit mountain biking tour all the heavy items are carried by porters or yaks and personal belongings that you may need for the day like money, water bottle, rain gear, camera, sunscreen and toilet paper etc. should be carried by yourself. We suggest bringing a day pack daily personal items as well as a large duffel for all your other gear. Ace the Himalaya will provide a waterproof and windproof duffel bag that is yours to keep after the trip. You can leave your bag with your non-trek items at the hotel in Kathmandu and collect them after the trip. 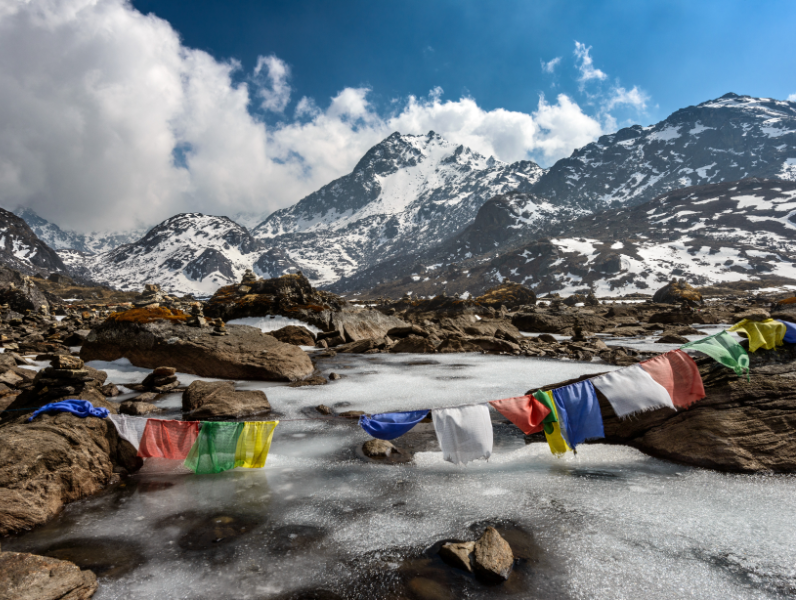 The most important fact that one should keep on mind is that you should have enough clothes to tackle the cold weather in the Himalayas, remember that you will be at a high altitude! To make sure all clothing stays dry please pack in waterproof stuff sacks or large puncture resistant plastic bags. None of the listed dates work for me, are other dates available? Yes other 2019-2020 departures are available on request. Can I upgrade my hotels? Yes, $300 extra per person if you want to upgrade the accommodation to a five-star hotel in Kathmandu and Pokhara. 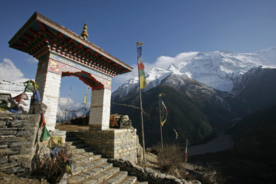 This option is unavailable for guesthouses in the Annapurna Circuit route. Can I book single rooms? Yes. Single occupancy rooms may be available at an additional cost of $600. Please contact us if you are interested. What physical fitness level is required for this ride? The Annapurna Circuit Mountain Biking Trip should only be undertaken by those with some previous mountain biking experience. You should be physically fit to brave the effects of higher altitudes as you ascend over 16,000ft which involve some steep climbing against headwinds. Biking at this level lasts for several weeks. A gradual ascent through a green river alley will lead you up to a number of high passes, where you will reach the altitude of 17,770 ft at the Thorung-La Pass. Do we need to be experienced long distance cyclists for longer tours? No. The guide will carefully pace the ride to include rest and refreshment along the way. Where available, the support vehicle will accompany you and you can always hitch a ride if you need a break. 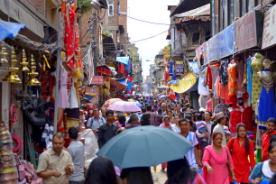 What sort of accommodation can I expect in Kathmandu, Pokhara and along the bike route? We use standard rooms at three-star hotels in Kathmandu and Pokhara with breakfast included. Along the biking route, teahouses/lodges generally provide basic clean facilities with a bed and a blanket. We can also offer you Ace the Himalaya sleeping bag and down jacket, if needed (to be returned after the trip) but it is a good idea to always have your own sleeping equipment. We usually provide single and double rooms, and occasionally a dormitory. In tea houses, food will be prepared in the kitchen which you should not enter without permission. The toilet in tea houses provides essential and basic facilities and are always outside the room. What kind of food can I expect in the mountains? Most teahouses (lodges) in the Annapurna Circuit biking trails cook a delicious range of mostly vegetarian fare. Pasta, tuna bakes, potatoes, eggs, dhal bhat, bread, soups, fresh vegetables (variety depends on the season) and even some desserts like apple pies, pancakes, and some interesting attempts at custard. You will find a lot of garlic on the menu because it assists with acclimatization – eat some every day. In many larger villages, you may find some meat items on the menu. You can always get hot chocolate, tea, and hot lemon drinks, as well as soft drinks, and treats like chocolate and chips. Each day dinner and breakfast will be at a lodge you’ll stay at while lunch will be taken on the way to destination. 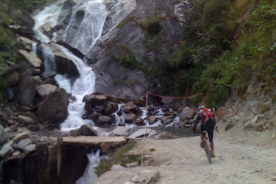 The best time for the Annapurna Circuit Mountain Biking is from March to May and from September to November. It is not very advisable to bike during the monsoon season from June to August except for Lhasa to Kathmandu mountain biking. Can I bring my own bike and accessories? You definitely can! It is highly recommended that you have your bike thoroughly serviced before coming on the trip. Spare parts are available in Kathmandu, but may not always be compatible with your bike. Most airlines are quite used to people traveling with bikes, and if a bike is properly boxed and within the luggage allowance, it is a relatively hassle-free experience. Please check with your airline for specifics. On arrival at your destination, you will be met by your leader, and you will just need a baggage trolley to take your bike as far as the transfer vehicle. Make sure the bikes are properly packed. You may do it yourself, or if you’re not sure, you could have a local bike shop pack it for you. *Ace the Himalaya takes every care to ensure your bike is well treated, but it is normal for a bike to sustain minor scratches, resulting during the daily ride as well as loading and unloading from support/transport vehicles. Yes you can rent a Trek, Giant or Specialized full-suspension mountain bike from Ace the Himalaya for $40-50 per bike per day. Yes. All the bikes are compatible with customized bike parts. The support team accompanying the group will be able help with any bike alterations or damage to the bike along the entire trip. Please inform us in advance if you plan to bring your own saddle and pedals. Are there any bike maintenance and repairs while on the trip? The support vehicle (where available) and the guide will carry the required repair tools and spares. We do recommend you carry some basic tools and spares (like a puncture kit and Allen keys). 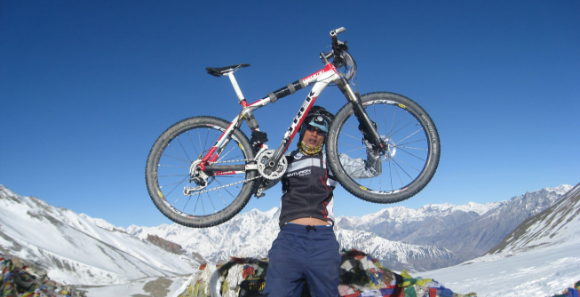 Our guides are also qualified mechanics and have ample experience maintaining bikes on the trips. These facilities will be available in most of the places in your hotel reception by paying some service charges. Remember to bring TWO and THREE pin travel adapters! Are there any communication facilities during the trip? There are telephones in some villages along the biking routes from which you can make international calls. Internet and international calls are readily available in Kathmandu and Pokhara. Can I use credit cards in the places I visit in the mountain? In the cities, yes – to some extent. Once you are out of the cities, you need cash. It depends on your spending habits. Generally, in Kathmandu and Pokhara, you can allocate USD 20 for a lunch and a dinner. USD 7 to 10 a day will be enough to buy bottles of water, chocolates and a few drinks during the trekking. This is a difficult thing to gauge. 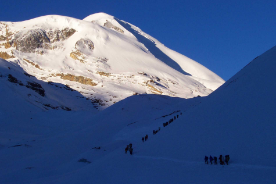 We have seen everything from USD 20 to USD 1000 per person for guides and porters. Tipping is not required, but a small gesture of thanks to your guides and local porters thanks for their help. The level of the tip should reflect the level of satisfaction from and personal involvement with your guide. Is the water fine to drink? Do I need to bring purifying tablets/filter? In most places bottled water is readily available. If you wish to drink normal water, you need to use purifying aid, which you need to bring with you. Valid Passport – must be valid for up to 6 months after you return from your tour, keep a separate photocopy. Travel insurance, keep a separate photocopy. Flight tickets. Emergency contact numbers for T/C’s, banks, insurance, family contacts. Can I add extra days to my trip? A holiday should never be about making it to the final point quickly. 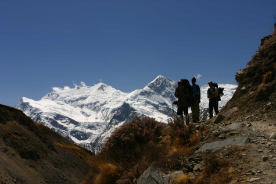 Along your trek we can add days at your request with additional costs to cover guides, porters, accommodation and food. No vaccinations are compulsory for traveling in Nepal, but we do recommend you are covered for diphtheria & TB, hepatitis A, hepatitis B, *malaria, typhoid, polio and tetanus. We also recommend: A dental check-up prior to travelling. That you know your blood group in case of emergency. 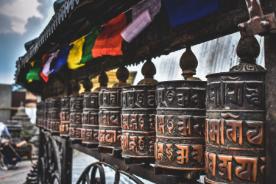 If you have any pre-existing medical conditions which might affect you on tour, you make these known to your tour leader and Ace the Himalaya at the time of your booking. Please note, each departures requires 2 or more guests to run. Please do not book flights until trip confirmation has been given by ACE the Himalaya. There is a 12 person maximum. evo upholds Ace the Himalaya’s policies regarding cancellation. Cancellation notice is required minimum 20 days prior to trip departure and must be made in writing, such notice commences from the day notice is received. Cancellation shall be valid with approval from the company after receiving documentation. The Trip shall then be termed as cancelled and a cancellation charge of 30% of the trip amount would be deducted from the advance paid. There will be no refund to clients that provide less than 20 days notice, before trip departure and if a passenger leaves a trip for any reason whatsoever, either voluntarily, involuntarily or if you commit any unlawful act after the trip has commenced. We will make no refunds for any meals, accommodation or services not used. I was picked up at the Airport as promised and well taken care of for the duration of the trip. The office was well organized and my guide Suraj and porter Kumar were both outstanding. The food in Nepal is generally pretty darn good and the people mostly welcoming. I had an epic trip and would highly recommend this route and this tour operator for strong, adventurous mountain bikers. Ace the Himalayas was a top notch company to deal with and the details were all covered from start to finish... The local knowledge of our guide Dipesh as well as the city guides made everything extremely interesting... All our accommodations were central and clean, the tea houses were lovely and friendly, exactly what I expected for this type of trip. The food in Nepal was amazing. An incredible experience made even better with our guide Suraj. Providing history, context and personal insight to the many places we visited on our trip, Suraj kept us laughing and pushing ourselves on the 2 week journey. Ace the Himalayas did a great job of coordinating our trip so we didn’t have to worry about a thing.